In this chapter, we’ll use a Python library called TextBlob to perform simple natural language processing tasks. The aim of this chapter is to introduce a few simple concepts and techniques from NLP—just the stuff that’ll help you do creative things quickly, and maybe open the door for you to understand more sophisticated NLP concepts that you might encounter elsewhere. The most commonly known library for doing NLP in Python is NLTK. NLTK is a fantastic library, but it’s also a writhing behemoth: large and slippery and difficult to understand. TextBlob is a simpler, more humane interface to much of NLTK’s functionality: perfect for NLP beginners or poets that just want to get work done. Of course, a computer can never really fully “understand” human language. Even when the text you’re using fits the abstractions of NLP perfectly, the results of NLP analysis are always going to be at least a little bit inaccurate. But often even inaccurate results can be “good enough”—and in any case, inaccurate output from NLP procedures can be an excellent source of the sublime and absurd juxtapositions that we (as poets) are constantly in search of. The Pattern library (like TextBlob, a simplified/augmented interface to NLTK) includes POS-tagging and some morphology for Spanish in its pattern.es package. There is no such thing as a sentence, or a phrase, or a part of speech, or even a “word”—these are all pareidolic fantasies occasioned by glints of sunlight we see on reflected on the surface of the ocean of language; fantasies that we comfort ourselves with when faced with language’s infinite and unknowable variability. Regardless, we may find it occasionally helpful to think about language using these abstractions. The following is a gross oversimplification of both how English grammar works, and how theories of English grammar work in the context of NLP. But it should be enough to get us going! I really love entrees from the new cafeteria. … it’s a noun. For this reason (and others), it’s difficult for computers to accurately determine the part of speech for a word in a sentence. (It’s difficult sometimes even for humans to do this.) But NLP procedures do their best! 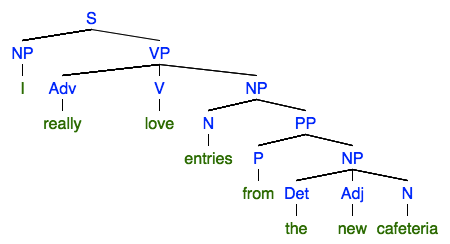 NLP libraries give us tools to parse sentences into trees like this, and extract phrases from the sentence according to what kind of phrase it is. Notably, TextBlob makes extracting noun phrases super easy. But note: if computers are bad at identifying parts of speech, they’re even worse at parsing grammar in sentences. You will get some wonky results, so be prepared. “Morphology” is the word that linguists use to describe all of the weird ways that individual words get modified to change their meaning, usually with prefixes and suffixes. e.g. A word’s “lemma” is its most “basic” form, the form without any morphology applied to it. “Sing,” “sang,” “singing,” are all different “forms” of the lemma sing. Likewise, “octopi” is the plural of “octopus”; the “lemma” of “octopi” is octopus. “Lemmatizing” a text is the process of going through the text and replacing each word with its lemma. This is often done in an attempt to reduce a text to its most “essential” meaning, by eliminating pesky things like verb tense and noun number. Even though we as humans employ plural morphology in pretty much every sentence, without a second thought, the rules for how to do it are actually really weird and complicated (as with all elements of human language). A computer is never going to be able to 100% accurately make this transformation. But, again, some NLP libraries try. At this point, let’s actually start using TextBlob so we can put this boring theory into practice. To use textblob, we of course need to install it! And to install it, we need to create or activate a virtualenv. Create a TextBlob object, passing a string with the text we want to work with. Use various methods and attributes of the resulting object to get at various parts of the text. ITP is a two-year graduate program located in the Tisch School of the Arts. Perhaps the best way to describe us is as a Center for the Recently Possible. Each sentence object also has an attribute .words that has a list of words in that sentence. TextBlob can also tell us what part of speech each word in a text corresponds to. It can tell us if a word in a sentence is functioning as a noun, an adjective, a verb, etc. In NLP, associating a word with a part of speech is called “tagging.” Correspondingly, the attribute of the TextBlob object we’ll use to access this information is .tags. This for loop is a little weird, because it has two temporary loop variables instead of one. (The underlying reason for this is that .tags evaluates to a list of two-item tuples, which we can automatically unpack by specifying two items in the for loop. Don’t worry about this if it doesn’t make sense. Just know that when we’re using the .tags attribute, you need two loop variables instead of one.) The first variable, which we’ve called word here, contains the word; the second variable, called pos here, contains the part of speech. Here’s a brief list of what the tags mean. You can see a more complete list of POS tag meanings here. Word objects also have a .lemmatize() method, which returns the word, but with all morphology (suffixes, etc.) removed. This example takes an arbitrary input text and parses it into sentences. It then prints out ten random sentences from the text that have five or fewer words. But the effort was painful. Let Wickham be _your_ man. >>> string_with_stuff = "weird \xe1ccents"
This program extracts all noun phrases from a text, and all verbs; it then randomly selects from these lists to generate dada instructions from the text. This program “summarizes” a text in a very basic way. It does so by examining the part of speech of each word, and appending the word to a list if the word is a noun; it then prints out five random nouns from the text in plural form. TextBlob also provides an interface to WordNet data. WordNet is basically a computer-readable thesaurus. You can use it online here. Wordnet’s most basic unit is the synset. A synset is essentially a “group” of different words that all mean the “same” thing. For example, wordnet might group “kitty,” “cat,” “feline,” etc. into a synset, categorized under the abstract concept of CAT. You can restrict which synsets to retrieve for a word for that word only when used as a particular part of speech (say noun or verb). This program reads in a ext, parses it into words, and then replaces each word with a random synonym (according to WordNet). Only words with three or more letters that have synonyms in WordNet are replaced. you are catch in the drift. that drive in the wind.